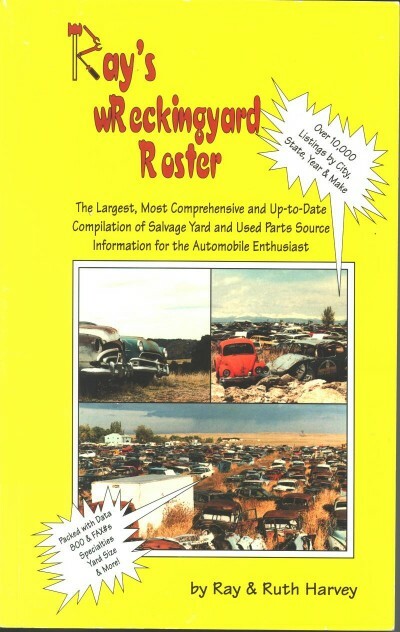 The book that started this business: Ray's wReckingyard Roster. Ray and Ruth wrote this book while Ray was recuperating from a truck accident. We made over 8500 phone calls to get this information. We have “rescued” some used copies. Since not a show goes by that were not asked “Do you have any copies of Ray's wReckingyard Roster?” We are making these used copies available. There are over 5000 yards listed and cross referenced. 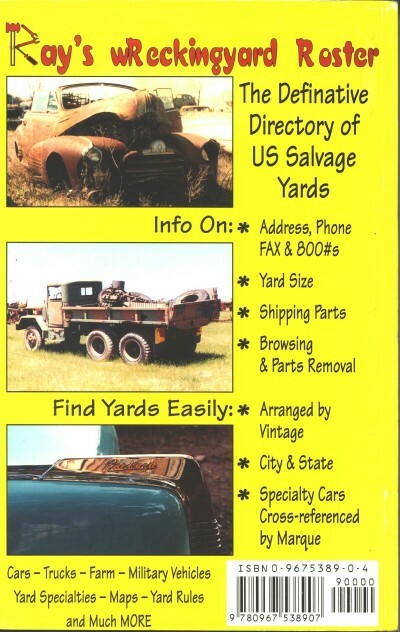 The listings are by state, city and age of vehicles in the salvage yard, Contact information, business practices ie. Can you take the parts off yourself? Do they take Credit Cards? In the back is a cross reference by vehicles such as Hudson or Prewar. Yes, we are planning a new issue and I pray it does not require another accident! Thanks to many of our readers, we have leads on the current status of the yards in the book and additional ones to be added. Please feel free to send any information you might have for this project. Thanks!